The Collins English Dictionary is a printed and online dictionary of English. It is published by HarperCollins in Glasgow. The first edition of the dictionary, in 1979, with Patrick Hanks as editor and Lawrence Urdang as editorial director, was the first British dictionary to use the full power of computer databases and typesetting in its preparation. This meant that, for instance, subject editors could control separate definitions of the same word and the results could be blended into the result, rather than one editor being responsible for a word. By the third edition, they increasingly used the Bank of English established by Hanks at COBUILD to provide typical definitions rather than examples composed by the lexicographer. The current edition is the 12th edition, which was published in October 2014. The previous edition was the 11th edition, which was published in October 2011. A special "30th Anniversary" 10th edition was published in 2010, with earlier editions published once every 3–4 years. The unabridged Collins English Dictionary was published on the web on 31 December 2011 on CollinsDictionary.com, along with the unabridged dictionaries of French, German, Spanish and Italian. The site also includes example sentences showing word usage from the Collins Bank of English Corpus, word frequencies and trends from the Google Ngrams project, and word images from Flickr. In August 2012, CollinsDictionary.com introduced Facebook-linked crowd-sourcing for neologisms, whilst still maintaining overall editorial control to remain distinct from Wiktionary and Urban Dictionary. This followed an earlier launch of a discussion forum for neologisms in 2004. In May 2015, CollinsDictionary.com added 6500 new Scrabble words to their Collins Official Scrabble Wordlist. The words are based on terms related to and influenced by slang, social media, food, technology, and more. 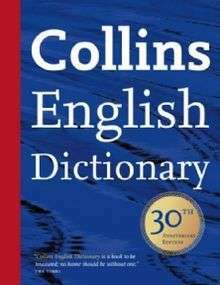 ↑ "Collins English Dictionary [12th edition]". Collins.co.uk. HarperCollins Publishers Ltd. Retrieved 6 December 2014. ↑ Collins launches free dictionary site Wired UK, 2012-01-03. ↑ Collins launches online dictionary to debate new words The Guardian, 2004-12-15. CollinsDictionary.com – Collins English Dictionary, American English Dictionary, Thesaurus, French, German, Italian and Spanish.